India 02 September 2016: Papaya is a fruit which grows in tropical climate. It has its origin from south america and is popular worldwide for its amazing taste and health benefits. Papaya plants grow in three sexes male, female, hermaphrodite. The papaya that you and me know comes from the hermaphrodite type of papaya tree which self pollinate since its flowers contain both male stamens and female ovaries. 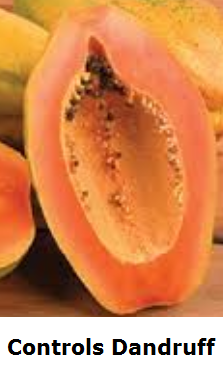 The scientific name for papaya is carica papaya. It's universally known as 'papaya' in English, as ‘Papita‘ in Hindi, ‘Boppayi Pandu‘ in Telugu, ‘Omakaya‘ in Malayalam, ‘Pappali‘ in Tamil, ‘Pappayi Hannu‘ in Kannada, ‘Papaiya‘ in Gujarati, ‘Papita‘ in Bengali and ‘Papai‘ in Marathi. Papaya was once an exotic and rare fruit which is now easily available in the market throughout the year. 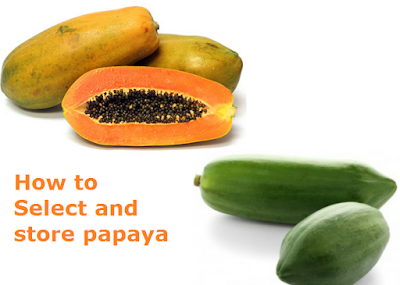 Ripe papayas are eaten plain as fruits, while unripe papaya is used in cooking curries and salads. Papain an enzyme present in papaya helps to remove all traces of dry and flaky skin and leaves your skin hydrated. Papaya helps in repairing and rejuvenating the skin. Using a papaya mask can make your skin soft and glowing. In a bowl mix mashed papaya and honey to form a thick paste. Apply this paste on your face and let it sit there for at least 30 minutes. 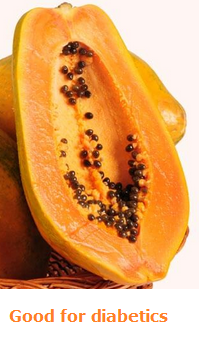 The enzyme papain present in papaya is used for skin exfoliation. When you exfoliate your skin you get rid of all the dust, dirt and dry skin. Using papaya for exfoliating will remove the pigmented layers of skin every time you do an exfoliation and help reduce and finally remove the pigmented mark. Take small cotton balls and soak them in papaya juice. Place these papaya juice soaked cotton balls on the affected areas of the skin. Let it sit there for 15 minutes and then rinse your face with cold water. Papaya is loaded with papain which an excellent natural exfoliator. 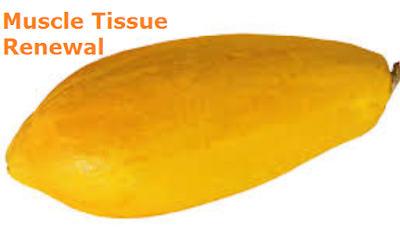 The papain present in papaya peels remove dead cells from the surface of the skin and rejuvenate the skin. This helps remove wrinkles and age spots from your face. For this you just need to take a papaya peel and rub it on your face and after 20 minutes rinse your face with cold water. 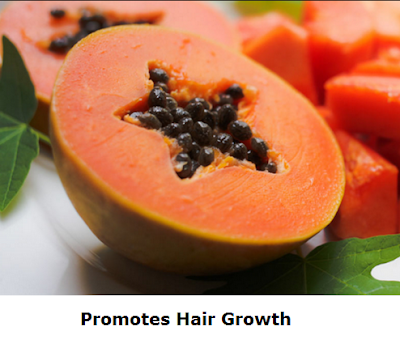 One of the lesser known benefit of Papaya is that it is very beneficial for Hair Growth. As papaya is loaded with folic acid which is essential for healthy hair growth, as it improves blood circulation to the hair follicles. The dandruff in our hair is caused due to fungal infection. 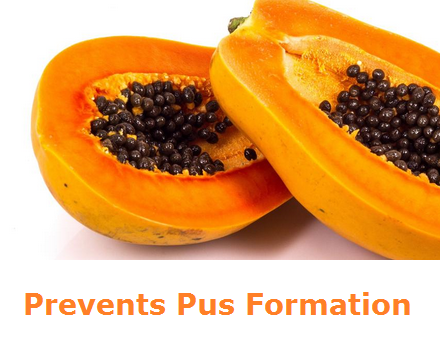 Papaya seeds have antifungal properties which can fight against the fungi causing dandruff. You can use papaya seeds as part of a hair pack to get rid of dandruff naturally. In a mixer mix papaya pulp along with its seeds to a smooth paste. Massage this papaya paste in your hair and scalp. Leave it there for one hour. Use mild shampoo and wash your hair. 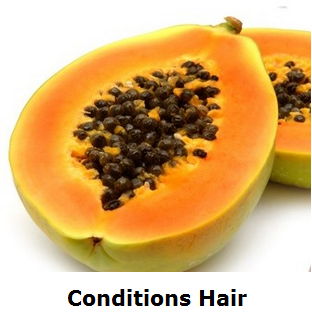 If you have dry hair problem then papaya can treat your hair and make it soft and moisturised. Papaya promotes the production of sebum in our body as it is rich in vitamin A. Sebum is the body's natural oil which keeps your hair hydrated and conditioned. 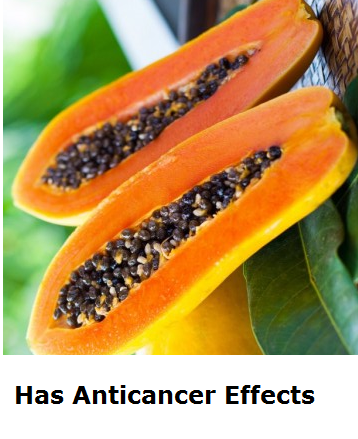 Take ½ papaya and deseed it. Now in a blender blend the papaya to a make a smooth paste. Add yogurt to this papaya paste and mix well. Apply this paste to your hair from the roots to top. Let it sit in your hair for one hour and then rinse it with water and mild shampoo. 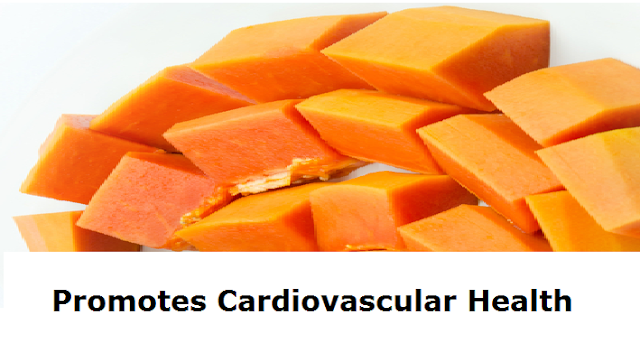 Papaya is great for keeping your heart healthy. It's one of the healthiest fruits. Papaya is rich in antioxidants like vitamin A and C which prevent the cholesterol in the blood from getting oxidized, which prevents it from blocking blood vessels and reduces the risk of heart attack. The loss of vision as age catches up is known as macular degeneration. Papaya prevents this from happening. zeaxanthin is an antioxidant present in papaya which filters the harmful rays which can harm the retina and thus reduces the risk of macular degeneration. Eating papaya gives a boost to your immune system as it is loaded with antioxidants. Antioxidants fight with free radicals by boosting our immune system. When you have an open wound there are bacteria present on the wound which slow the body's function of healing the wound. 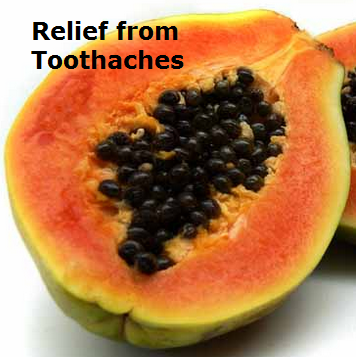 Applying crushed papaya seeds to the wound speeds up the healing process by fighting the bacteria. Papaya for ages has been used as an home remedy for treating all kinds of stomach ailments including indigestion, acid reflux, and stomach ulcers. Fibre is an important nutrient needed to maintain digestive health. Papaya being rich in fibre helps to maintain our digestive system. Research has shown that papaya seeds work well to fight many different types of cancer. 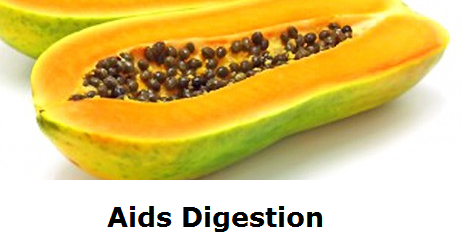 Papaya Seeds contain isothiocyanate which works well to stop the growth of cancerous cells. Arthritis is an disorder that causes inflammation of the joints. 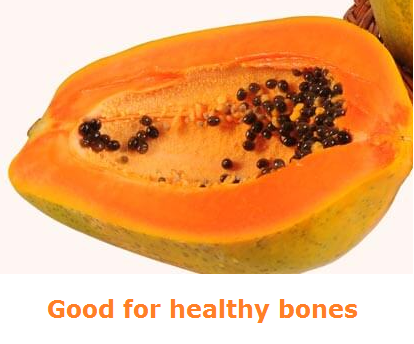 Having papaya regularly gives you relief from this pain as papaya has anti-inflammatory effects. Papaya is rich in numerous antioxidants. These antioxidants help in preventing cholesterol oxidation in the blood vessels. Cholesterol Oxidation creates blockage in blood vessels. 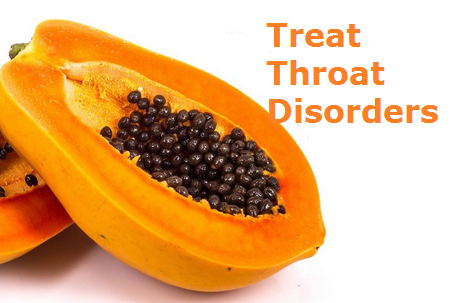 If you are suffering from inflammation in lungs then you should start eating papaya. Vitamin A present in papaya is known to prevent inflammation in lungs. If you have inflammation in your tonsils, then unripe papaya juice with honey is an excellent home remedy for treating it. This juice helps in dissolving the membrane and prevents the spread of infection. 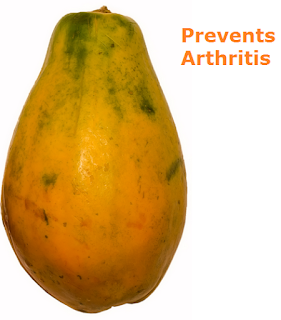 The juice of unripe papaya is used as a natural remedy to reduce swelling and stop pus formation in wounds. Crush or blend fresh unripe papaya chunks and strain them to extract juice. Apply on the wound and leave on 15 – 20 minutes or until dry. Rinse with cool water and pat dry. 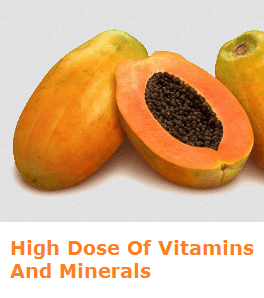 Papaya is rich in various vitamins and minerals. 100 gm of Papaya contains 60 mg of vitamin C, 37 ug of folate acid, 950 iu of Vitamin A, 182 mg potassium, 21 mg magnesium and 20 mg calcium. 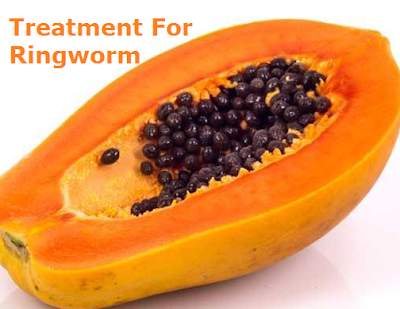 Raw Papaya is one of the best remedies for treating ringworm. 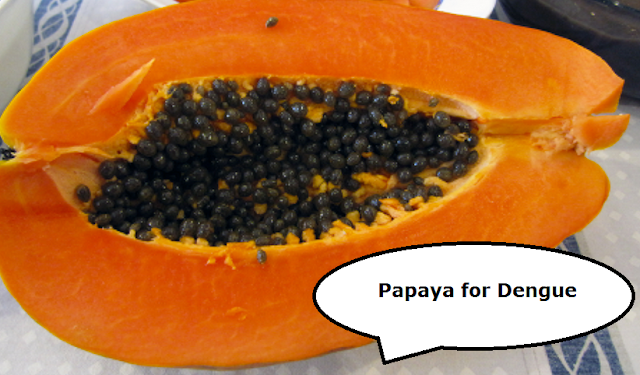 The enzyme present in raw papaya is effective in killing the fungus that causes ringworm. 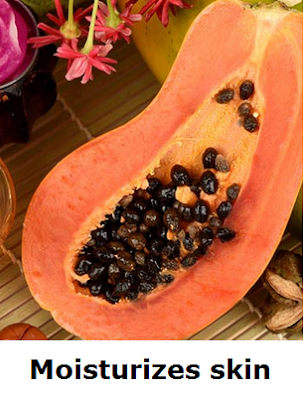 Make a paste of Papaya and its seeds using a blender. Apply this paste on the ringworm affected area. Let the paste sit there for 15 minutes. Rinse it off using hot water. Papaya milk not only revitalizes the human body by increasing strength, but also helps in the renewal of muscle tissues. This is because this milk is a rich source of protein, which is required for optimal muscle health and repair. Papaya is loaded with antioxidants and contains more amount of beta-carotene than carrots. The antioxidants present in dried papaya help to improve immunity and destroy free radicals that are dangerous for our health. 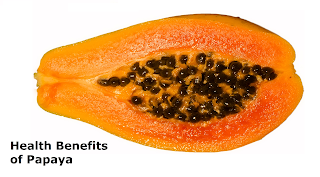 Papaya is rich in bioflavonoids. Also known as vitamin P, bioflavonoids are considered as important nutrients that work as nature’s modifiers that respond to the biological changes in the body. 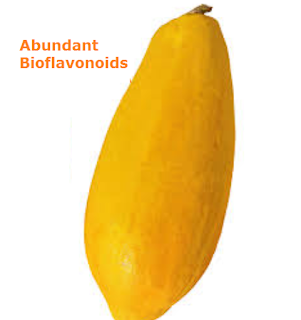 The bioflavonoids in papaya modify the reaction of the body to compounds such as viruses, carcinogens, and allergens, thereby protecting it from harmful and life threatening diseases. Raw papaya is rich in several minerals, including iron, potassium, copper, phosphorus, manganese, calcium and magnesium. Even the dried papaya contain adequate traces of minerals including calcium, magnesium, and potassium. An essential amino acid known as Arginine is said to activate human growth hormones (HGA). These hormones play an important role in the process of rebuilding bones, muscles, skin, and liver cells, and promote overall cell rejuvenation. 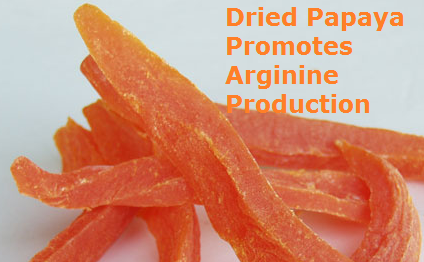 Dried papaya gives nourishment to the endocrine system and increases the production of arginine in the body. The risks for developing asthma are lower in people who consume a high amount of certain nutrients. 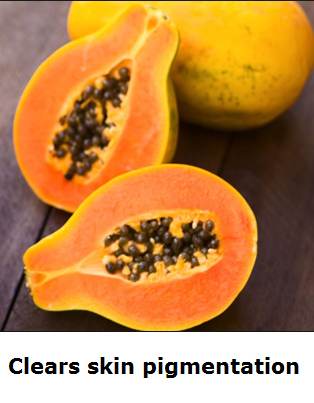 One of these nutrients is beta-carotene, contained in foods like papaya. 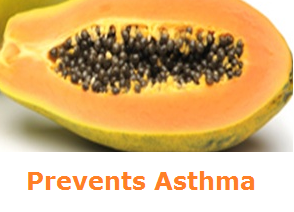 Papaya is loaded with beta-carotene and hence helps in preventing asthma. Peoples whose intakes of vitamin K id low have been associated with having a higher risk for bone fracture. Adequate vitamin K consumption is important for maintaining healthy bones, as it acts as a modifier of bone matrix proteins, promotes calcium absorption and may reduce urinary removal of calcium. Research has proven that people who consume a high fiber diet have lower blood glucose levels. 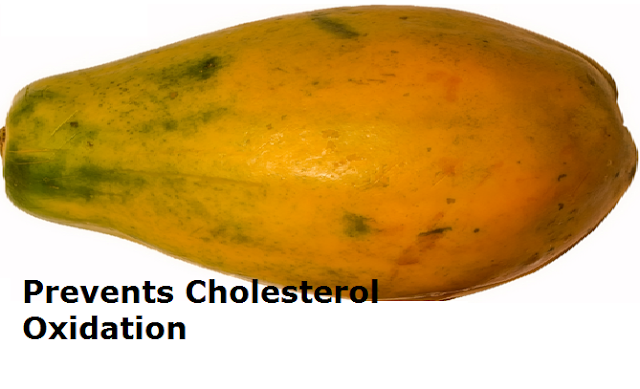 Papaya is rich in dietary fiber making it an amazing addition to your diabetic diet. 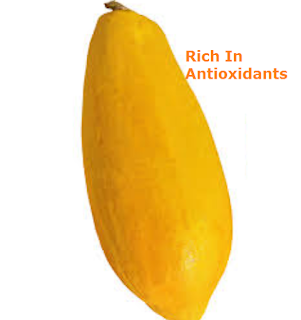 Papaya fruit have anthelmintic and antiamoebic properties. 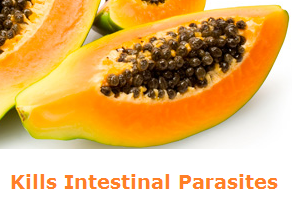 This means they kill intestinal worms and other parasitic organisms in your digestive system and using papaya seeds for parasites has proven to be very effective. A stroke involves the sudden interruption of blood flow and oxygen to areas in the brain and can cause brain damage and loss of function. Papaya is rich in antioxidants and these antioxidants protect the blood vessels from getting oxidized, which leads to blockage. 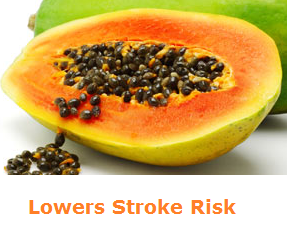 Having papaya reduces the risk of having a stroke. Juice of papaya leaf can be used as an home remedy for Toothaches. Take a papaya leaf stick, scrape the bark, then sqeeze the juice out into the paining tooth. Repeat 2-3 times. After some time, the pain should disappear. When you have dengue your immune system becomes weak. 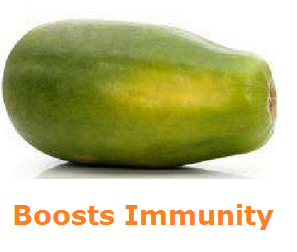 Papaya is loaded with nutrients which help to increase your immunity. Papaya juice can be of great help for women with irregular periods. Papayas are considered as a ‘hot food’, meaning that it produces heat in the body. This excessive production of heat in the body stimulates the estrogen hormone. This induces periods in the females. 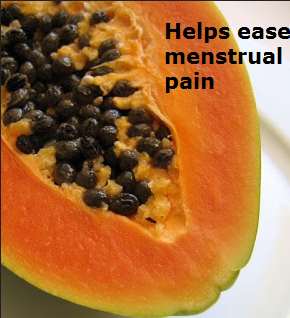 Hence, papayas can be beneficial to handle difficult periods. Papayas are considered hot foods because of the high concentration of latex. Latex, present in high concentrations in raw and semi-ripe papayas, causes the uterine to contract which might lead to abortions. Avoid eating raw papaya if you are pregnant. Eating large amount of papayas can cause pain in the intestines or stomach, and can sometimes cause esophageal perforations. 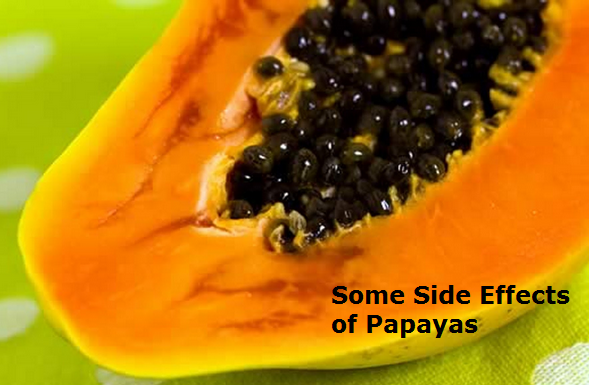 The seeds of papaya contain carpine which is said to be toxic in nature. Carpine make the nerve centers numb, which could lead to paralysis or cardiac depression. Papaya continues to ripen even after plucking it from the tree. When the papaya is ripe the skin color is reddish orange and they are good to eat. Papayas which are yellow still need a few days to ripen up. Ripe papayas need to be stored in refrigerator after slicing them. Consume ripe papayas within two days.